The Penny Brite doll was released in 1963 by Topper Toys, a subsidiary of Elizabeth, New Jersey-based toy manufacturer, Deluxe Reading. Penny was presented as a more wholesome alternative to Mattel’s Barbie Doll, which at the time was getting a bad rap in some parenting circles for being “too adult” for young children. Specifically, Penny Brite was less curvy than Barbie and had a more conservative clothing line. At 8-inches tall, Penny had poseable jointed arms and legs and a head that swiveled on a ball joint. Rooted blond hair, side-glancing black and white eyes, and dimples rounded out her facial features. She was dressed in a red and white pleated dress, red hair bow, and flat white shoes. Penny Brite was sold in a plastic carrying case with a clear plastic front. The carrying handle could be swung down into the box, transforming it into a clothing rack for Penny’s outfits. A slot in the back of the case housed a clothing pamphlet and other advertising. Penny Brite was on the market for seven years, eventually disappearing from store shelves in 1970. 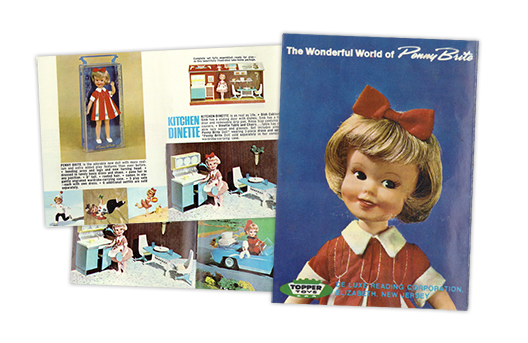 For a glimpse into the doll’s clothing line and related playsets, check out The Wonderful World of Penny Brite, an advertising booklet from 1963. Released in 1978 from Tomy, Fashion Plates allowed budding fashionistas to design their next line of haute couture for the catwalk aka the family bulletin board or refrigerator. The Wooly Willy Magnetic Drawing set proves the wisdom of the adage, “If it ain’t broke, don’t fix it", with more than 75 million sold since 1955.